This past Friday, May 25th, I attended "the inaugural event at THERE" which took place in NYC. At the event I saw the painting featured in the image atop this entry. The piece is titled Veils #4, and was created by Phyllis Floyd, one of the founders of an association named Zeuxis. "According to the Naturalis Historia of Pliny the Elder, Zeuxis and his contemporary Parrhasius (of Ephesus and later Athens) staged a contest to determine the greater artist. When Zeuxis unveiled his painting of grapes, they appeared so real that birds flew down to peck at them. But when Parrhasius, whose painting was concealed behind a curtain, asked Zeuxis to pull aside that curtain, the curtain itself turned out to be a painted illusion. Parrhasius won, and Zeuxis said, 'I have deceived the birds, but Parrhasius has deceived Zeuxis.' This story was commonly referred to in 18th- and 19th-century art theory to promote spatial illusion in painting. A similar anecdote says that Zeuxis once drew a boy holding grapes, and when birds, once again, tried to peck them, he was extremely displeased, stating that he must have painted the boy with less skill, since the birds would have feared to approach otherwise." 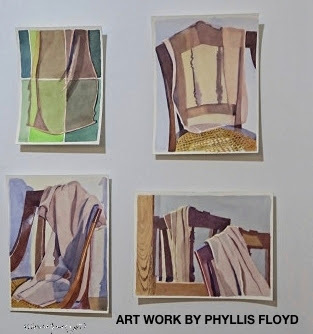 I've never asked Phyllis Floyd if the name of her art association had anything to do with the fifth century painter, nor did I ask her if her painting, Drawing the Curtain #10, that is included in the exhibition (and can be seen below) was influenced by Zeuxis's (the painter) curtain experience. Be that as it may, in the exhibition, these two paintings of Floyd's are grouped with two of her other paintings, Drawing the Curtain #3 and Drawing the Curtain # 8, as seen in the next photograph. 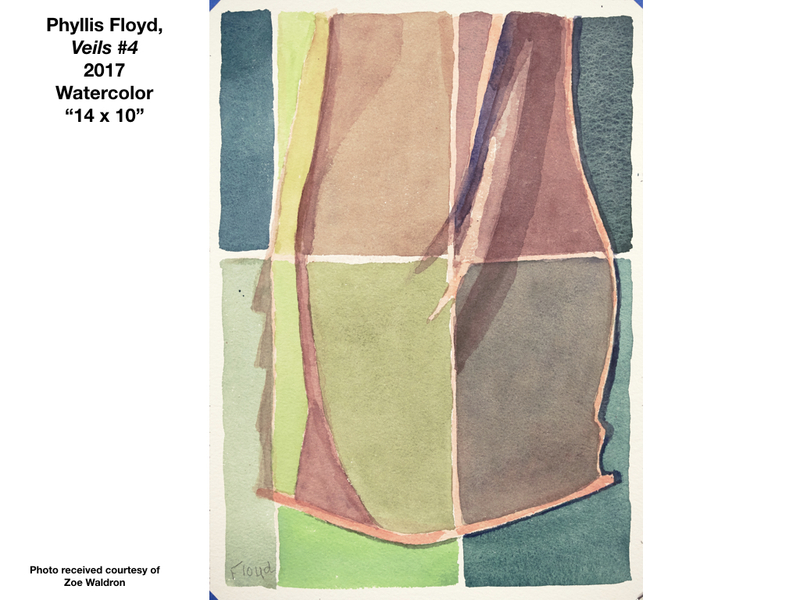 Admittedly, my images do not reflect the colors of Floyd's work as I took them with a "pocket" camera, but am including them here to give you a sense of how they look in the exhibition. 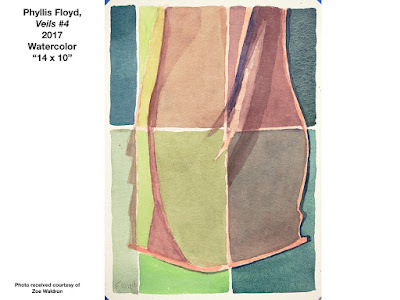 I highly encourage you to go to the exhibit so that you can see Floyd's works with your own eyes, not through the lenses of any of the images included here. In the meantime, I'd like to share a few of the other works of art that I saw at last Friday's inaugural event. 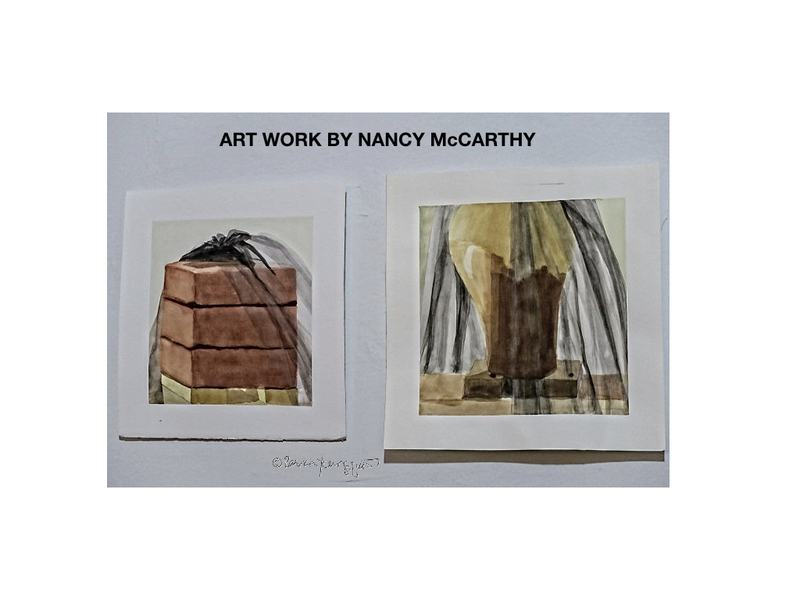 The two pieces (as they appear in the exhibition) seen in the next image are by Nancy McCarthy. 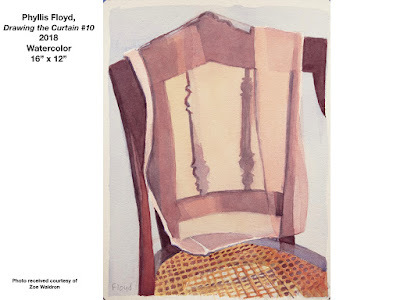 But as with Floyd's work, I took the photographs with a "pocket" camera, and am only including them here to give you a sense of their appearance in the exhibition. 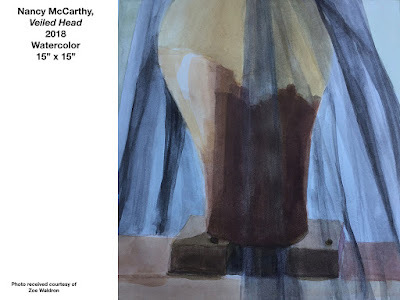 The following pictures can give you a better sense of McCarthy's paintings. Deborah Kirklin, Still Life with Rocks & Bottles (2016 Watercolor on Arches, 16.5" x 18.5"), John Goodrich, Tulip Vase, Ceramic Basket and Orange (2004 Watercolor, 14.25" x 10”), Megan Williamson, Untitled (2015, Watercolor, 7" x 11”) Gabriel Laderman, who has two works, Still Life With Angled Lines (1951 Pen on Paper, 10.5" x 9.25”), and Interior With Mirror (1958 Etching on Paper, 17.5" x 23.5”), Ruth Miller, A’s Watercolor (1987, Watercolor, 19" x 23”), Gwen Strahle, Untitled (2010 Ink Wash on Paper, 11" x 15”), Rita Baragona, who has four pieces: Spring Light Through Veil (2018 Gouache and Watercolor, 5" x 9.5"), Still Life With Self-Portrait Hidden Behind the Veil (2018, Watercolor, 5" x 6”), Blue Bells & Veils (2018, Watercolor & Pastel, 6.5" x 5”), and Self Similar Iterations (2018, Watercolor & Pastel, 6.5" x 5”), Carol Stewart, who has two pieces, This Time (Gouache on Paper, 9" x 8”) and This Place (Gouache on Paper, 9" x 8”), Tracy Collamore, Waiting, Always (2018, Watercolor, 12" x 18”), Bevin Engman who has two pieces, Twilight Study (2017, Colored Pencil on Sanded Paper, 8.5" x 8.5”) and Morning Light Study (2017, Pastel on Sanded Paper, 10" x 10”). FRONT ROOM: Richard La Presti, Still Life with Orange (2018 Watercolor, 18" x 25"), John Goodrich, StillLife with Vase and Bananas (2000 Watercolor, 7" x 10.25”), Temma Bell, Titus Napping (2018 Black Ink on Paper, 18"x 24”0, John Goodrich, Plums, Peach and Chinese Bowl (2005 Watercolor, 7" x 11.5”), Tracy Collamore, She’ll Take The Purple Cow 2018 Watercolor, 16" x 20”) and Ying Li, Unveil, 2013 (Mixed Media on Paper, 9' x 12"). 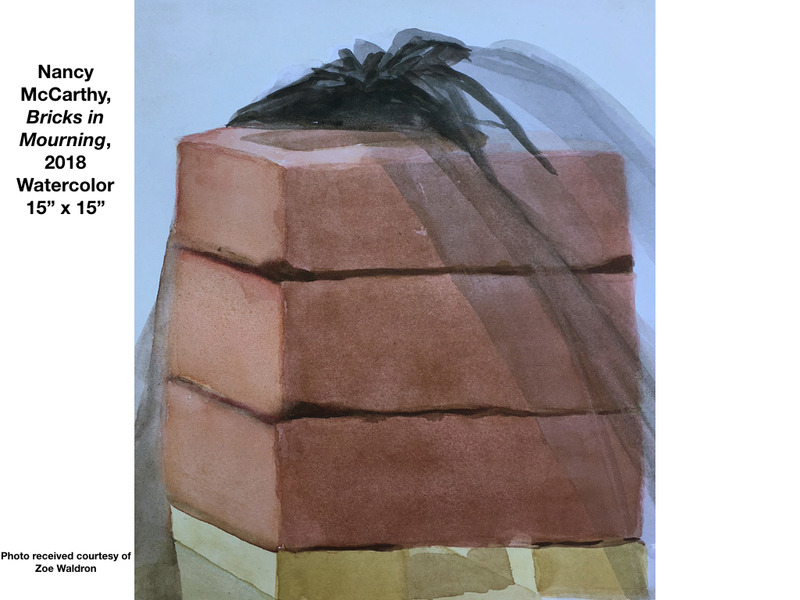 SIDE ROOM: Philip Jackson, Untitled (2018 Oil on Museum Board, 9 x 12”), Matt Klos who has two pieces, Veil 2017 (Pastel, 9" x 9”) and Fort Howard #11 Interior (2017 Graphite, 8" x 6.5”), Neil Callander, who also has two pieces, Kelly 1 (2018, Gouache and Ink, 15" x 11”) as well as Kelly 2 (2018 Gouache and Ink, 15" x 11”), and Amy Mahnick, Tree Free (2018 Gouache on paper, 5"x 7”). 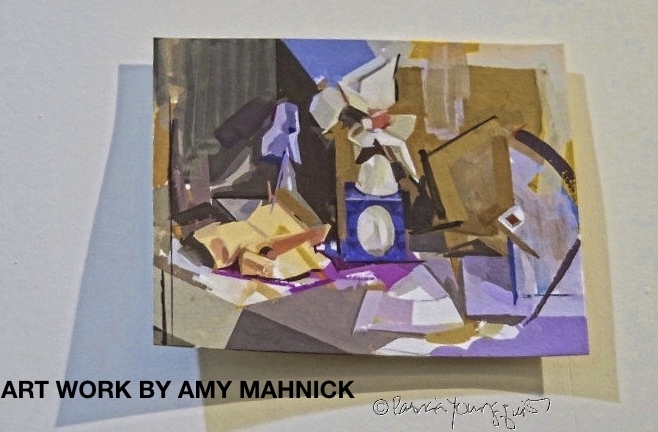 Mahnick's piece as it appears in the exhibition can be seen below. She and I spoke re how a small sized art piece commands the viewer to come closer to take a better look. 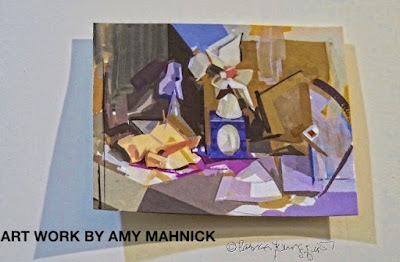 Since I took the photograph of Mahnick's piece with my "pocket" camera, I have not given justice to it as the case with the pictures I took of Floyd and McCarthy's paintings (which I mentioned earlier). 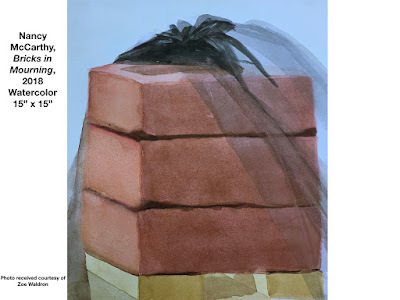 But fear not, dear reader, all the artworks that were on view this past weekend can also be seen this Saturday and Sunday (June 2+3) from 12-6PM, as stated within the link I provided in the first paragraph, posted here again for your convenience.